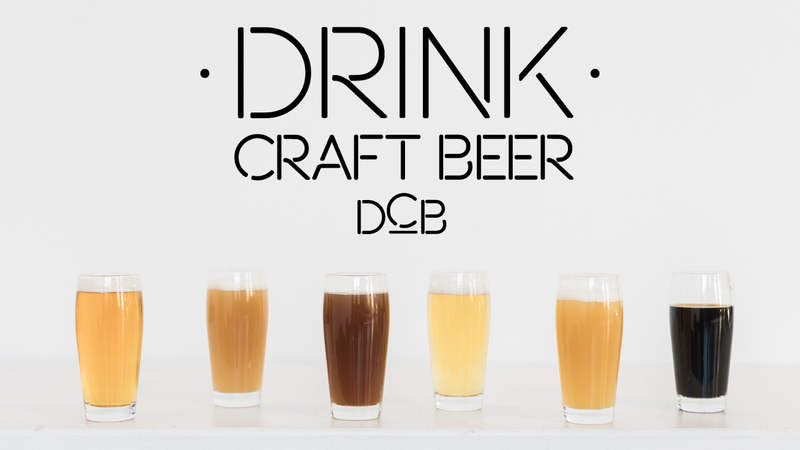 “Drink Craft Beer.” It’s more than a catchy phrase. It is a call to action. When I arrived in Boston from Florida back in 2012, I was overwhelmed by the amount of craft beer that was available around me. I had never been to a beer festival before. Here I was, a law student in the big city, surrounded by options but unsure of how to dive into the world of craft beer. It wasn’t until I attended a Drink Craft Beer festival that I learned all that craft beer could be and more. Little did I know that Drink Craft Beer had already reinvented itself because of people like me and would continue to reinvent itself again and again as they years went by. To this day their festivals hold a special place in my heart. Let me share part of their story with you and you may understand why that is. Back in 2006, good buddies Jeff Wharton and Devon Regan founded Drink Craft Beer as a beer blog. Jeff and Devon would travel the country interviewing brewers and tasting amazing beer. However, they realized that by only blogging about beer they were simply talking to people like them who were already interested in craft beer and that they weren’t doing anything to broaden craft beer’s audience. That is when they started to host small, in-person tasting events for a few dozen people. These events would grow into much more than they could have ever imagined. 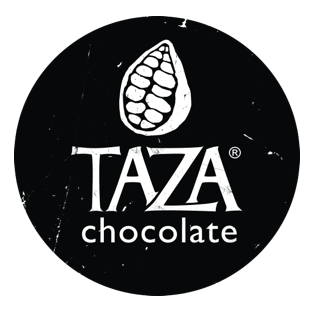 Their first reinvention came about thanks to a local company called Taza Chocolate. One of their sales reps was at a liquor store pairing wine with some of their chocolates. Jeff suggested they could pair beer with their chocolate as well. They went down to the Taza Chocolate factory to do just that, and a light bulb went off. They could build an event around something like this! They did so and what was once dozens of people became hundreds of people showing up for their events. Based on their growing popularity, they decided it was time to reinvent themselves once more. Their second reinvention happened when they had an idea for a seasonal rotation of beer festivals in 2012. They hosted Summerfest, Fall to Winter Fest, and Springfest, each fest focusing on a different style of beer. I personally attended their first festival and went on to volunteer at others then began to write about them and for them before becoming a simple attendee enjoying the experience once again. These events regularly sold out, had an amazing list of brewers, and even won a prestigious Best of Boston award in 2014 from Boston Magazine. Besides all that, what drew me into these festivals and kept me coming back was the community around them. Drink Craft Beer is a company built by friends and family, and they make each person attending their festivals feel like a friend. The smaller size of their festivals allows for a greater level of intimacy and the ability to actually talk to and get to know the people behind the beer while hearing their stories. Not only does one learn a great deal about beer at these festivals, but they make connections and develop friendships that help to grow one’s love and passion for craft beer and its community. After years of hosting these festivals, Drink Craft Beer wanted to bring something more to the table. There were many beer festivals in Boston, but they wanted to do something different. They figured that Drink Craft Beer is for people who like stuff that tastes good, so why not host a festival featuring producers of both food and beverages pairing their creations together? 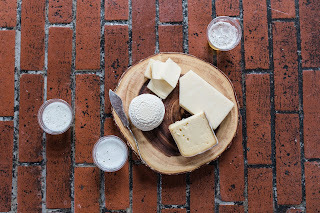 This was their third reinvention, and in 2015 they hosted the inaugural Boston Beer & Cheese Fest. It sold out faster than any of their events had ever before. Many brewers wanted to be part of it, and cheese makers from around New England keep asking to come back every year. Their fourth and most recent reinvention came from the realization that the audience for craft beer had changed significantly since 2006, when it was a small niche and mostly homogeneous. The audience for their fests was transcending the stereotypical craft beer crowd you saw at other fests. It was much more diverse, with a majority of attendees being women and the overall crowd being different than your typical festgoers. They were more aligned with foodies than the craft beer uber-enthusiast. They were people who liked stuff that tastes good! With this greater diversity came the need for greater inclusion and so, on the eve of Drink Craft Beer’s 20th festival last week, they launched a new look for their brand. Whereas before their brand was made up of more in-your-face, gritty, masculine imagery, their new logo is much more subtle, sleek, and modern. Their events had fit their audience, and now their brand and merchandise do as well. It is a brand that is open and appealing to anyone who likes stuff that tastes good. I’m not sure what Drink Craft Beer’s next reinvention may be, but I can tell you that I am excited for whatever they have planned for the future. I’ve been happy to be able to witness part of their story and to see them grow both personally and professionally over the years. It is because of them that I got into craft beer and that I continue to be passionate about it to this day. Their festivals are about so much more than beer, with cider makers featured prominently and often winning the “best of show” along with culinary creations from around New England that I have never tried before. They feature local brewers and give new brewers a chance. Their brand is about more than beer, too. It’s also about the people that love making stuff that tastes good and the people they share it with. It is because I identify so closely with their brand that I drank from my favorite Drink Craft Beer pint glass for years and will use their new glassware featuring their new logo for years to come. 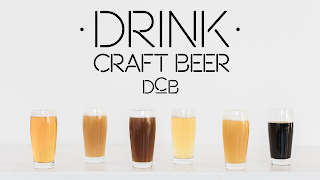 If you haven’t been to one of Drink Craft Beer’s events or seen their new branding, you should check them out at DrinkCraftBeer.com. Become part of their story and let them become part of yours. I promise you will not be disappointed. See you at the next fest! Standing amongst a sea of barrels and giant oak foeders filled nearly to capacity inside Trillium’s Barrelhouse, I can’t help but feel incredibly fortunate to be celebrating Zwanze Day in such a special location. Only a short distance from their brewery and taproom in Canton, JC and Esther Tetreault invited 180 lucky individuals through a random ticket selection process into their Barrelhouse for a behind-the-scenes look at their barrel program. Having spent past Zwanze Days lining up to get into a packed bar for a taste of Cantillon, I can say that celebrating Zwanze Day at a brewery is the only way to go if you can do so. Trillium not only put on one of the best Zwanze Days I’ve been to, but one of the most well-run beer events I’ve ever attended. I walked into the Barrelhouse with no idea of what to expect; this was the first time that it had been opened to the public, after all. As I entered I was given a tulip glass filled with Trillium’s Lineage Spelt, a barrel-aged saison that was fruity, acidic, and refreshing; a nice introduction to the type of beer that awaited us. Walking down a hallway filled with Trillium’s signature label artwork, I eventually entered the Barrelhouse, where a few pop-up bars had been set up amidst mountains of barrels along with some tables and chairs as well as a food stand. It was truly an awesome sight to behold. As I sipped my saison I decided to walk around and read which beers were aging in the barrels that surrounded us, many of which I’ve had before. Several of the fantastic Trillium beers featured at the event had come from these barrels. There’s something very special about drinking beer in the room where it’s made, even moreso when the owners are drinking it with you. JC and Esther walked around during the event mingling with everyone, from myself to brewers like Paul Jones from Cloudwater or Matt Tarpey from The Veil. When I spoke to JC he expressed nothing but humility about this day. He never thought that someone like him, originally a homebrewer from Brookline, would be chosen to host Zwanze Day. He was honored to be able to pour some of Cantillon’s lambics for the second year in a row. I was just as humbled to be there drinking them with him. As the worldwide toast approached, JC and Esther both spoke about how excited they were to have everyone there and thanked everyone for supporting them over the years. If it were not for that support, they said, they would have never been given an opportunity like this one. The two parents of two raised their unique glasses filled with a lambic dedicated to the youngest son of Cantillon’s owner and toasted to friends and family. In that moment I had never felt more personally connected to a brewery and the people behind it. So what was the coolest part of Zwanze Day for me? It wasn’t getting to see Trillium’s Koelschip or drinking a wide selection of superb sour beers. For me it was sharing that experience with people that cared just as much about Trillium as they did about Cantillon. People that had a great deal of respect and reverence for both breweries, as I’m certain the two breweries have for one another. That is what made this Zwanze Day celebration unlike any I had been to before, and it is why I hope to be able to celebrate every Zwanze Day at Trillium in the future. I’ve been a fan of Somerville Brewing Company since I moved to Boston back in 2012, when I first saw their nickname “Slumbrew” on bottles in stores. I drank Porter Square Porter before ever actually visiting Porter Square. I met many so-called “slumbassadors” and other members of the Slumbrew community over time, and remember wondering when they would have a brewery of their own for us all to gather and drink together. That’s why I was so excited when they opened their Boynton Brewery in 2015, and it’s why I’m even more excited for the next chapter in the Slumbrew story. I sat down with co-founders Caitlin Jewell and Jeff Leiter to talk about their plans over a beer. Somerville Brewing Company is set to open its new American Fresh Brewhouse at Assembly Row within the next month or two. Construction is ongoing, but Caitlin and Jeff told me that they are are devoting most of their time to ensuring that it gets up and running soon. That’s something they can commiserate with the crew behind Backlash Beer Company on, as they continue to build out a brewery in Roxbury after years of having their beers on shelves. Caitlin tells me that she sometimes calls Helder Pimentel of Backlash and they talk about the ups and downs of building a brewery. The American Fresh Brewhouse will be a great addition to Assembly Row and the Somerville Brewing Company brand. The location is ideal, being 35 feet away from the local T stop at Assembly, one of the nicest subway stations in Boston. On top of that, there will be plenty of parking with 200 free spaces available for those visiting the Brewhouse. There will be 126 seats along with some outdoor seating as well, much bigger than the American Fresh beer garden at Assembly Row. The Brewhouse will also have a 3.5 barrel brewing system for making those good liquids that Slumbrew has become known for. Overall, the American Fresh Brewhouse is another step forward for a company that has continued to grow and improve every year, creating a solid foundation for their future. Slumbrew’s motto has always been “make good liquids, make good friends.” Their initial focus was on producing quality beer, and they did just that. I haven’t found a friend that doesn’t like Slumbrew’s Happy Sol, a hefeweizen brewed with local honey and fermented with juice from over 1,000 blood oranges. They then created physical spaces for fans of their beer to gather and enjoy it together. They started offering brewery tours at the Boynton Brewery, hosting all sorts of events, and perhaps most importantly serving food from their own kitchens. This was a natural progression for the Somerville Brewing Company, and one that has led them to where they are today. The Boynton Brewery taproom offers a wide range of meal options, from charcuterie boards to pizzas (my personal favorite), while the beer garden has a somewhat smaller but similarly tasty menu. Both locations have flourished with the work that Jeff and Caitlin have put into them and no longer require as much of their guidance as they once did, allowing them to focus more on their latest project. The beer garden that opened in 2014 will remain open until the end of this month, when there will be a send-off celebration. I’ve had some good times there and will miss the space, but I am looking forward to enjoying the new Brewhouse even more. There is something to be said for a brewing company choosing to close one of its locations in order to direct resources to a more ambitious project. There have been multiple instances of breweries moving too fast with opening new locations or expanding at such an unsustainably rapid pace that they are eventually forced to close or sell. This seems like a much more responsible move for Somerville Brewing Company, as a year-round beer garden in New England, even with heated tents, must be hard to maintain. The new Brewhouse should take some of the best things about the beer garden and make them even better. The American Fresh Brewhouse at Assembly Row is an evolution for Somerville Brewing Company. Jeff has experience in the restaurant industry, and for some time now both he and Caitlin have wanted to offer an even greater experience to their fans in terms of both food and beer. The Brewhouse is designed as a “gastrobrewery,” not a brewpub. Whereas brewpubs are often primarily restaurants with beer brewed on premises, gastrobreweries are primarily producers of beer with an elevated food menu. Different from the typical fare of food trucks and pop-ups one often sees at their local taproom, Slumbrew’s new gastrobrewery will have its own chefs, a full kitchen, and an extensive menu featuring dishes ranging from steak to seafood. In a time and place (specifically Boston) in which local breweries are all basically making good liquids, how does one stand out among the rest? The key, Caitlin and Jeff believe, will be offering the full gastrobrewery experience to consumers. No longer having to bring or order food from outside or waiting for a food truck to show up. Not having to settle for bar snacks and instead being able to order a full, flavorful meal with the beer one goes there to drink. That is what a gastrobrewery is all about, and that is what the American Fresh Brewhouse at Assembly Row will offer. I, for one, cannot wait to experience it. As I wrote about a couple of weeks ago, Craft Beer Cellar is a strong and growing franchise. The brand they’ve created is one that consumers have come to associate with a positive beer buying experience. Though, even with such a great brand, every store is different. Each Craft Beer Cellar looks similar, but still has its own vibe and atmosphere. This may be because of a unique layout or special decorations, but mostly it comes from the people that own and run the store. The staff beer geeks create a customer experience that goes above and beyond what consumers have come to expect when buying beer, and every store is an opportunity to enjoy the Craft Beer Cellar experience like it’s the first time. One of the latest additions to the Craft Beer Cellar family has been open for a month today, and it’s been pretty monumental. I say that not just because it shattered the Grand Opening sales record for the franchise when it opened its doors on August 6th, but because it opened in none other than Washington, D.C. Located a couple of miles away from the White House and less than a mile away from where Congress passes our country’s laws, I reached out to store owner Erika Goedrich to ask her some questions about how this important store fits within the Craft Beer Cellar franchise. What made you want to open a Craft Beer Cellar store? 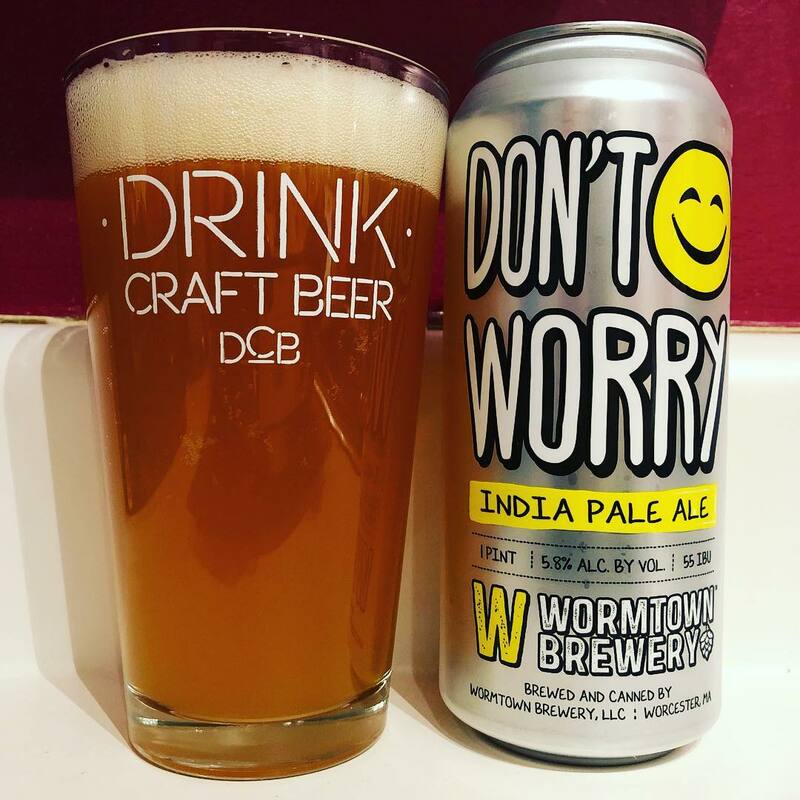 Erika: I’ve been kicking around the craft beer world for almost 20 years, mostly as a hobby, though I did work at Old Dominion Brewpub in Ashburn, VA (prior to it being bought) and started a craft beer rating and recommendation website with a friend (before untappd was cool). I am super passionate about craft beer, not just for the beer, but the history, and entrepreneurship, the people, creativity and ingenuity, the individuality yet the community. For a long time, I thought about opening a craft beer bar, but the food side was never of much interest to me, and it seemed a bit more than I could handle. A mutual friend introduced me to Kate and Suzanne at SAVOR before they opened the Belmont store. I met them again at another mutual friend’s wedding as they were beginning to franchise. I started to pay closer attention and visited the Belmont store when in Boston. I was amazed because we didn’t have anything like CBC in the DC area that I was aware of. DC area breweries and bars were stepping up their game, but the retail side was lacking…too often I found beers on the shelf that were out of date, the hospitality and knowledge weren’t there. I knew I wanted to own my own business, just not sure what. And then one night I was at a bar and a customer must have been wanting wine but didn’t like anything from the small wine selection, so the bartender gave her a sample of something. The customer thought it was really good and asked what it was. The bartender’s response was, “it’s beer.” I had to stop myself from banging my head on the table. The poor customer never found out she was drinking a framboise; would never be able to ask for it again. And so I decided that I wanted to open a craft beer store, and follow a model where great beer selection, hospitality and education are at the forefront. What would you say is special about your Craft Beer Cellar location? Erika: Beer, particularly craft beer, brings people together. And it’s not just about the beer, but about the people and experiences and memories built while drinking beer. I’ve decorated the store with pictures of people doing different activities while enjoying beer. I want people, whether they consider themselves to be craft beer aficionados or craft beer novices, to feel welcome, like they are entering a friend’s house. We want to teach as well as learn – certainly we don’t know everything. We want to explore more of the craft beer world alongside our customers and industry partners. We want to foster a community around craft beer. Since you are familiar with CBC, the fact that the entire store is available for mix-and-match won’t shock you. But it’s a novel concept in DC; “revolutionary” is what one customer called it. We changed the law in DC. I appreciate that the ABRA Board was willing to review our request and ruled in our favor, as it’s the consumer who wins because of this. They get to experiment and try various beers and breweries without having to commit to 4 or 6 of something they may not like. What is the craft beer community like in DC? Erika: It’s welcoming and supportive. Opening a business in DC is not easy, and everyone (from people in the industry to people in the neighborhood) have been helpful, friendly, patient and all-around wonderful to work with. It’s evolving. DC Brau, DC’s first package brewery, just celebrated its five-year anniversary earlier this year, so we’re all still very young and learning. No one has all the answers. We (CBC DC) certainly don’t. But everyone is hungry to learn and to push and support everyone to be better. That includes consumers, who have embraced the mix-and-match, and are asking about tastings and other educational events, because they want to learn and explore. What is one thing you think everyone should know about Craft Beer Cellar? Erika: We’re passionate about craft beer and we want to share that passion with others. We’ve been both applauded and criticized for putting a per-person limit on rare beers that we’ve had. Our goal here is just to make these beers accessible and available to as many people as possible and be fair in the process. DC has what’s known as “gray laws”, where if a distributor does not have a beer available or in the quantity needed, you can go out and get it yourself and pay an import fee. It’s why you will find beers not distributed here on some shelves and taps. Customers have asked us to get some of these rare beers this way. As we get our feet more solidly under us, we will be reaching out to various breweries. But we will use this only with the brewery’s knowledge and permission. And we will continue to be fair in our pricing of these beers. What are some of the craft beers on your shelves now that you'd recommend? Erika: We’d be here all day. And it all just depends on what the customer is looking for or what I’m in the mood for. I’d recommend that people continue to take advantage of our mix-and-match and explore different beers and different styles. Try multiple beers from the same brewery. Try multiple beers within a style. I’d even recommend going back to a beer you had years ago, and may have loved or even hated. Our palates evolve and change over time, as do breweries. So your opinion of the beer may change, or you may fall in love all over again. You can tell from Erika’s answers that she is truly passionate and knowledgeable about craft beer. I would certainly describe Craft Beer Cellar as a revolutionary franchise, and I know that whenever I am in DC I will be stopping into her store. So next time you’re exploring the monuments in our nation’s capital, make sure to visit the store stocked with some of our nation’s finest beers. It is your patriotic duty. Back in 2014, I wrote an article about how Craft Beer Cellar was changing the world, one craft beer at a time. At that time there were a total of 13 Craft Beer Cellar stores open across the country. Now there are 26, including one in our nation’s capital. The CBC franchise continues to grow, with many more stores in planning. As I said years ago, things just keep getting better with each new store that opens. It’s no wonder that Craft Beer Cellar was recently named one of the 50 Best Beer Stores in America by Men’s Journal and the best beer store in Massachusetts! When I interviewed Suzanne Schalow, one of the owners of the Craft Beer Cellar franchise (and a #MasterCiceroneInTraning), back in 2014 she told me that each year they come up with a word to represent the year ahead. In 2014, it was “maturity,” in that with their rate of expansion they had to be mature enough to realize they couldn’t do everything. In 2015, the word of the year was “honesty.” Effective on January 1st, 2015, Craft Beer Cellar chose to no longer exclude beers based on ownership as it had in the past. 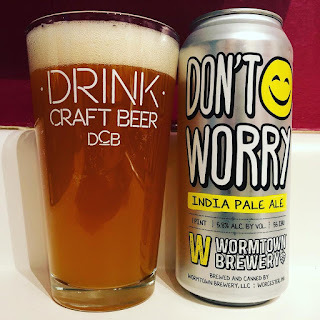 There is an honesty in letting beer speak for itself, and it was an honest move by Craft Beer Cellar to focus on the quality of the beer it sells rather than who makes it. For 2016, the word to sum up the year for Craft Beer Cellar is “change.” Last year, owners Suzanne and Kate sold part of their franchise and brand store to longtime friends, Joseph Yarid & Marla Yarid-De La Cruz. They brought on others to help them with managing the daily operations of their rapidly growing franchise. This has undoubtedly changed things for the better and made the Craft Beer Cellar family stronger as a whole. Considering how far Craft Beer Cellar has come, I thought now would be a good time to reflect on their success and to get a fresh perspective from some of the newer stores. To do so, I reached out to a couple of the new kids on the block: CBC Fenway and CBC Fort Point. Craft Beer Cellar Fenway opened on April 2nd of this year. I live in the Fenway neighborhood and work right across the street from the store, so a Craft Beer Cellar opening nearby was a dream come true for me. I’ve been a loyal customer of whichever Craft Beer Cellar store was closest to me since I bought my first beer from them. It was the business model that attracted me. It’s all about choice at Craft Beer Cellar, and the amazing staff help you to make the best and most educated choices when it comes to beer. It’s no different at the Fenway store. Owned and operated by Phil DiCarlo and Jana Wolfova, the store is located just a block or two away from the historic Fenway Park in Boston. I first met Phil and Jana before the store had even opened, when they invited me in to see how they were getting ready. Since their Grand Opening they’ve been just as inviting, greeting those who enter the store with a smile. I often stop by after work just to say hello or attend a tasting. Each time they or the beer geeks on staff have made me feel more than welcome. It is truly my favorite place to buy beer. Phil also told me about how they looked at several locations around Boston, but knew they wanted to be in Fenway after seeing an open storefront while driving through the area. It took Phil and Jana two years to open their store in Fenway, with many regulatory and construction hurdles to overcome. It was a trying time for them, but they were patient and committed to seeing their store open. I next asked Phil what the craft beer community in Fenway is like. “Since opening in April, the Fenway store has been everything we could hope for in the two years leading up to opening; a real vibrant enthusiastic neighborhood with very passionate craft beer drinkers,” he said. “We get a very mixed group of customers; some locals who have been thrilled to have us in the neighborhood, some tourists that are in town for a Sox game or a concert and looking for local craft beer, commuters working in the area.” I’d consider myself to be in the first category of customers. Craft Beer Cellar Fort Point just opened on August 17th. Located steps away from the renowned Trillium Brewing Company, CBC Fort Point adds yet another option for beer geeks near Boston’s Seaport District. Trillium is an incredible brewery, there is an amazing restaurant and bar known as Row 34, and now there is an outstanding bottle shop right around the corner at 34 Farnsworth Street. I attended the Grand Opening at which I tasted some of Suzanne’s favorite beers, including the Orval Trappist Ale. Those that came in for the tasting couldn’t help but learn something as Suzanne spoke knowledgeably about each beer she sampled, noting the Brettanomyces used by Orval. It was tasty and educational! I also had the opportunity to meet the owner of the store, Barry Sussman. He told me, as many others have, about how he had been a customer at the Belmont store and had been inspired to open one of his own. He also spoke of how helpful Phil and Jana of CBC Fenway had been in dealing with the hurdles the city and the state put in front of him. It was nice to hear how supportive other members of the Craft Beer Cellar family had been, and as I looked around I noticed it for myself. Owners of several other stores had stopped by and were there as customers continued entering the store to buy and taste beer. One big, happy family! Mike Callahan expressed similar feelings. “Awesome staff, amazing beer selection,” he said. He’s been to both the Fort Point and Westford locations, but goes to Westford more based on its proximity to him. Seems people like visiting their local Craft Beer Cellar as much as they like visiting their local brewery. Craft Beer Cellar continues to age like a fine barleywine. With each year that passes and every new store that opens, the brand grows stronger. Owners, beer geeks, and customers all become more educated as they become involved in the continuous learning process of craft beer. People come to associate the name Craft Beer Cellar not only with the selection and service, but also with the experience. There’s nothing quite like shopping at a Craft Beer Cellar and, if you haven’t already, I’d suggest visiting the one nearest you as soon as you can. I've wanted to brew my own beer for years. Ever since I met my first brewer in person, I've thought of brewing myself. That's why after thinking about it for a long time and being encouraged by friends, a few months ago I took the plunge and finally started homebrewing. That's a decision I am very happy that I made. To start things off I travelled to my local homebrew supply store. It's a small shop, but has everything you need to brew batches of beer in all styles and sizes. When I visited the store I asked the owner how he would recommend that I start brewing. He recommended that I start all-grain brewing instead of using malt extract, as he found homebrewers who did so were more engaged and learned more quickly. I decided to follow his advice and chose an Oatmeal Brown Ale recipe for my first homebrew. The owner of the store then walked me around the store to help me collect the ingredients for the recipe. We first collected the grains that would be needed to produce fermentable sugars for the yeast to consume. We then put the grains into a mill for grinding, save for the flaked oats that would be added to the brew. Next we picked the hops and finally the yeast to complete the recipe. Now, I live in a small studio apartment in Boston. Part of my hesitance to begin homebrewing was the amount of space it would take. However, the store owner informed me that all I would basically need was the room to store a 5 gallon bucket. After hearing that, I purchased the necessary equipment including the kettle, siphon, hydrometer, cleaner, sanitizer, bottle brush and capper, as well as the fermentation and bottling buckets. I then went home to prepare for my first brew day. After cleaning and sanitizing all of my equipment (perhaps the most important part of brewing), I filled my kettle with water and put in on my stove to begin heating. I placed a nylon straining bag in the kettle and, once the water reached the required temperature, added the grains. As the malted grain released its sugars, the water soon turned into wort. I next took the bag out of the kettle and began boiling the wort before adding the hops I had chosen. Once enough time had passed I placed the kettle in a bath of ice water in order to chill the wort down to the necessary temperature before pouring it into the fermentation bucket, sealing it, and pitching the yeast. My brew day was over, but fermentation had just begun. I had taken a hydrometer reading from some of the wort in order to obtain the original gravity, which provides a glimpse of the possible ABV of the final brew. I placed the fermentation bucket in my closet and over the next few weeks monitored it to ensure the brew was fermenting (usually by observing the airlock for carbon dioxide release) and to maintain the correct temperature. Bottling day, when it finally came, was relatively easy. It mainly entailed filling and capping, besides transferring the beer from one bucket to another, adding some priming sugar, and cleaning up afterwards. I then let the bottles sit to condition for another couple of weeks. I decided to purchase labels for my first homebrew and to enter it into a local homebrewing competition for fun. Upon tasting the beer I was glad that it had turned out as I hoped it would. I received positive feedback from friends and family, who seemed to enjoy it even more than I did. Overall the experience was very educational and a lot of fun. I just finished my second homebrew, a honey wheat ale, and I am very much enjoying brewing as a hobby. I'm not sure where it will lead, but I do know there's nothing quite like drinking your own beer. This week I read a post written by Carla Jean Lauter, otherwise known as The Beer Babe, with her take on the best beers in Maine this year. Her post inspired me to reflect on my own year of beer here in Massachusetts. As we're now in the last month of 2015, it seems to be an appropriate time to write about the best beers and breweries I've had the pleasure of experiencing throughout the year. I attended the American Craft Beer Fest in Boston back in May, at which I had the chance to try beers from throughout New England that I had never had before. I tasted my first brew from Lord Hobo Brewing Company, which is now available in most stores in the area. I also got the chance to try a beer from Medusa Brewing Company for the first time, but I knew it would not be my last. Their Zweihänder Imperial IPA displayed a talent for using hops, which was only confirmed after later tasting some of their other IPAs like Citra Legacy and Laser Cat. Here's hoping we see more brews available from Medusa in the Boston area! It seems like every year the new beers being released in Massachusetts continue to improve. This year was no exception. When Trillium Brewing Company released a Double IPA known as Artaic back in May, it instantly became a favorite of mine. Named after a local mosaic design company Trillium collaborated with, Artaic is brewed with 100% Mosaic hops and local raw wildflower honey. It is sweet, citrusy, and nicely balanced overall. A masterpiece! This year Night Shift debuted its flagship IPA, Santilli. Created from one of the brewery's batches of its rotating IPA called Morph, Santilli smells of fresh pine and has a big citrus flavor with a bitter finish. It's a surprisingly smooth IPA loaded with hops that I could drink just about every day. The fact that it comes in a beautiful tallboy can makes it even better! Earlier this year, Clown Shoes released a new version of its Undead Party Crasher with some tasty twists. Rye malt was added to the mix, and the usual hickory smoked malt was replaced with oak smoked malt from Blacklards Malt Company in Texas. On top of that, half the beer was aged in bourbon barrels while the other half was aged in rye barrels. These halves were then combined and bottled as an Imperial Stout with a roasty coffee aroma followed by the sweet taste of milk chocolate along with a creamy oatmeal flavor and a rye whiskey finish. It was delicious! Hay is for Horses was first brewed in 2013 but was available in bottles this year. A "Nordic" Pale Ale brewed with fresh, locally grown hay as well as oats and gruit herbs, the beer is light and grassy with a nice spice. Very easy to drink! Massachusetts has some incredibly talented artists creating the labels for its breweries. Whether it's Kevin Cimo's rustic and charming renditions of local landmarks for Trillium Brewing or Michael Axt's eye-catching and colorful work for Clown Shoes, there is no shortage of beautiful label art around here. Yet, one beer's label caught my eye more than any other, and it was based on work that artist Sophy Tuttle did for Backlash Beer. Years ago Backlash featured her art on the labels of the beers in their Apocalypse Series. They were black and white, but depicted epic scenes with rolling landscapes. 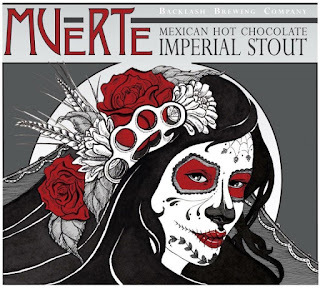 Her artwork was featured on the label for Death, Backlash's Imperial Stout, which was then inverted for the label of Resurrection released last year. 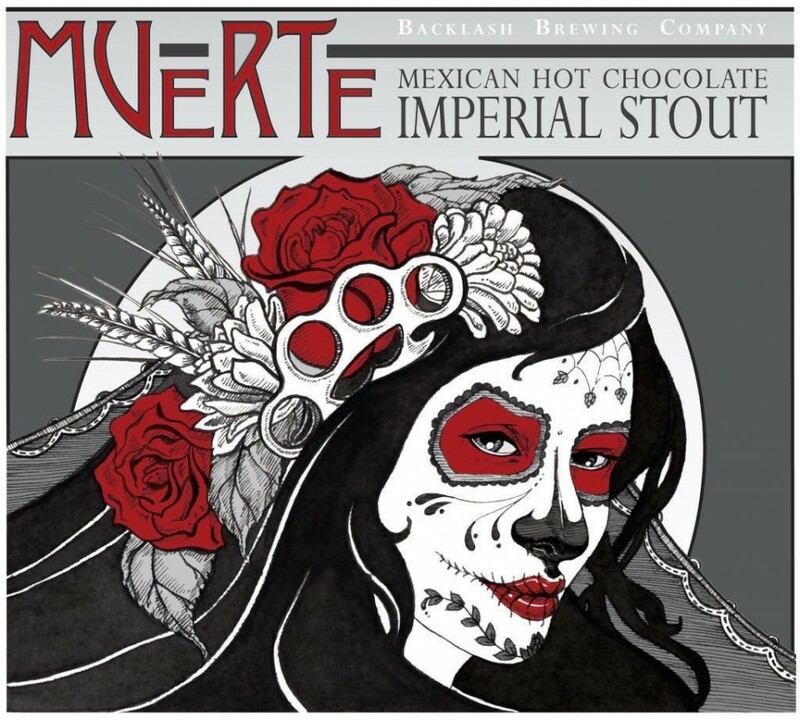 This year her work returned on the label of Muerte, an Imperial Stout brewed with vanilla beans, cinnamon, peppers, and coffee. Featuring an elegant portrayal of the classic calavera representing the Mexican holiday often referred to as Day of the Dead, the label is absolutely gorgeous. I hope we see more of Sophy's label art next year! Raising the Barstool. Powered by Blogger.